The dining room offers a magnificent backdrop for a family party or dining experience. Furnished in antiquity the Dining room has played host to many a warm welcoming event over the years. The dining table has seating for fourteen with full services of china, cutlery, glassware and silver and the room has at it's heart a magnificant open fireplace which can be easily lit for a truly magical party atmosphere. The dining room is situated right next to the billiard room which offers a delightfull and fun place to retire after a meal. 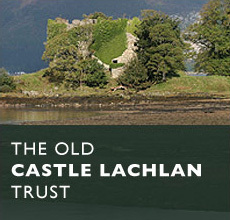 Castle Lachlan estate also offer a range of catering options should you choose allowing you to relax and let someone else prepare food on your behalf. At the heart of this magnificent house lies the grand hallway. It's features include clan history, nautical antiquities, stag heads and a beautifull old grand father clock. The sweeping staircase leads to the first floor and the majority of the public rooms can be accessed from this fine wood panelled room. The main door of the castle which is accessed via this hallway leads to the lawn, woodland walks, the old castle ruins and the shore of the loch. A traditional farmhouse style kitchen with a large table and a 4 oven Aga. The kitchen is equipped with a dishwasher, microwave, food processor and an additional gas cooker. Adjoining the kitchen is a large cool larder with a fridge freezer. A separate laundry has a washing machine, drier and an ironing board. For more informal dining a large dining table holding up to 12 people for a cosy meal in the warmth that only an Aga can provide. There is also a high chair for younger residents.